"We're the bad guys." It's a common phrase heard throughout Suicide Squad, the latest expansion of the DC Cinematic Universe after Zack Snyder's Batman v Superman: Dawn of Justice. The characters making up the eponymous team here are on constant alert to remind us just which side of the morality coin they prefer. Seeing "the worst of the worst" being forced to team up is an idea that works wonders on paper. Hell, it even works wonders in execution at least part of the time. But Suicide Squad, for all of its entertainment value, becomes the latest casualty to studio interference and the dreaded, editing machine. What's left over has just enough verve and edge to let us in on the film that could have been, a potentially great film, too, and the charisma felt from those characters goes a long way. It doesn't hurt that the team is led by Mr. Charisma himself, Will Smith playing Deadshot, a skilled hitman who pines away for the affection of his daughter from his prison cell. You see, Batman, doing what Batman does in Gotham City, captured Deadshot as well as Harley Quinn, a former psychiatrist turned supervillain played by Margot Robbie. Like Deadshot she yearns for the day when she can escape her cell and return to her one, true love, that being the Joker (Jared Leto), and we all know how bad that crazy character can get. Along with a handful of other villains and "metahumans," the criminals are given a once in a lifetime opportunity that comes from the very government that has incarcerated them. 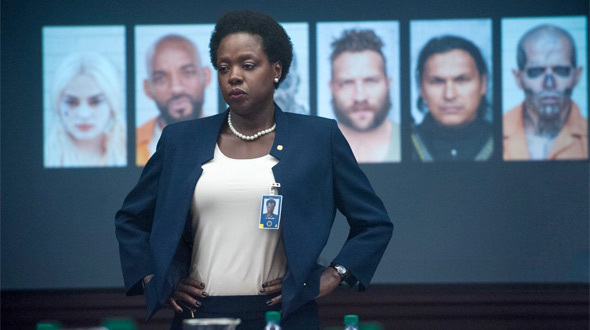 Viola Davis plays Amanda Waller, a mysterious government executive whose brilliant plan sees her controlling this superteam of sadistic killers and horrifying monsters. Also keeping the group in check is Rick Flag, the squad leader in the field played by Joel Kinnaman. What could possibly go wrong with this plan? It isn't long before we find out precisely what that could be, and the newly created team is forced into a rescue mission in the heart of a city under siege by strange creatures. Also, the Joker is hot on their heels. It isn't difficult to deduce why hard-edged filmmaker David Ayer took on the task of writing and directing Suicide Squad. His action films are often weighed down by the darkness found within the characters he creates. Films like End of Watch and Sabotage are as gritty as they are intriguing and each come loaded with engaging characters, some, as is the case with the Ayer-written Training Day, even falling into iconic status. Taking a batch of comic book villains through a grim, urban adventure would seem to fall right in line with the filmmaker's previous work. Much of the Ayer factor can still be felt in the finished product here, the bad guys proving their nefarious standing with not only words but actions, as well. The screenplay doesn't mince attitudes with any of the characters. Deadshot shows early on just how good he is at taking someone's life. Harley Quinn doesn't apologize for the voices in her head or for the clearly dysfunctional relationship she has with "Mr. J." Even Waller and Flag come complete with a murky gray area that shows they might be just as bad as the criminals they're controlling. Where Suicide Squad slips up in tremendous fashion, though, is in the editing, the pacing, and the structure of its finished product. It comes in from the start like a race car already in fourth gear, speeding through flashbacks that serve as brief intros and a vague notion of the mission on which the team finds itself. So much is glossed over and assumed in the early moments of the film that it's a wonder the whole thing isn't more convoluted than it is. It helps that Ayer keeps the story relatively focused, though many aspects to that story come through as awkward. I'm sure the filmmaker understands all the choices his characters make, but much of it just doesn't come across as clearly as it should. Also, the Joker shows up. I've made that joke twice now, but it really emphasizes the way Suicide Squad handles the iconic DC villain. Leto's method performance notwithstanding, the character plays like an afterthought in the film. He pops up here and there like the shark from Jaws reigning terror and executing chaos on anyone, good or bad, who decides to get in his way. It isn't the execution itself that misses the mark in Suicide Squad, though, it's what the character's presence means to the overall narrative, and, apart from the internal conflict it creates in Harley Quinn, it doesn't mean much. Leto grits his silvery grill through red lips, and, for the most part, he plays the part suitably psychotic. Smith and Robbie, on the other hand, bring out the real charm in the cast. Smith's genuine warmth almost does a disservice to the highly lethal Deadshot. 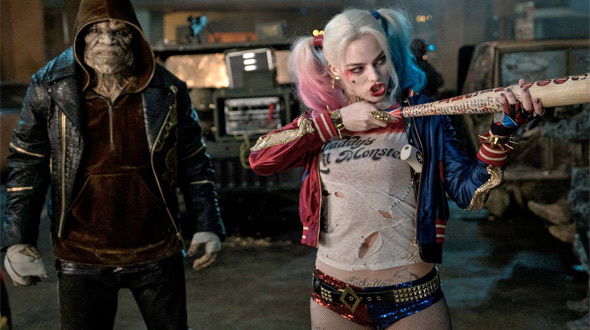 Robbie kills it in her performance as Harley Quinn and ends up creating the only iconic figure the film has to offer. Davis does the same with Waller but to a lesser extent. The supporting cast of characters fills the wide array of colorful criminals with a decent amount of success. Jay Hernandez shines as Diablo, a gang member who also dabbles in pyrokinesis. He gives the character's rare arc the genuine nudge it needs to be effective. Jai Courtney offers some comedic relief as Captain Boomerang, whose special abilities you can clearly assume from his moniker. Adewale Akinnuoye-Agbaje gives Killer Croc a performance that nearly comes through the CG effects that make up the reptilian creature. Neither Cara Delevingne as Enchantress nor Karen Fukuhara as Katana add much to their parts, but that assumes they're even given much with which to work. The vague development on those supporting characters is an issue found across the board, too. Suicide Squad suffers from poor editing that chops the backbone out of the finished results leaving bloated bouts of excitement that don't add up to much. It's never a dull result, Ayer's handling of the film's action keeping your attention span in firm grasp. There is this nagging sense there could have been a grittier and far more rapt story behind those action scenes, though. It feels like there should be a more world-expanding yet efficiently constructed narrative to go along with those bright characters and fascinating performances. Suicide Squad is an all-in-all improvement over the narratively flat and outright confusing Batman v Superman. If the DC world is to continue this course correction into their expanding universe, though, it may be time to start focusing on the actual story they're wanting to tell. Also have the Joker show up. So the editing really hurt this film this much? I will be seeing it tonight. I still want to believe. The editing ruined the film. In the future there will be textbooks telling film students about this film. How they must not make the same mistakes. While your at it, tell them NOT to cast Jesse "Nervous Nellie" Eisenberg!! It's too late. You should have started a petition earlier. I felt the pacing was frenetic and chaotic, which mirrored the characters in the movie, and I felt it worked. It wasn't boring or slow by any means (especially compared to B v S). The second act phoned it in a bit though. Like all the effort was in the setup, and then the second act was a paint by numbers super hero movie. Guardians of the Galaxy was a success because people related to Star Lord and empathized with him. I suspect none of the characters in Suicide Squad was likable enough to root for him. You are wrong all the characters were relatable. The execution of the film was bad. Thanks for the info Chris. I love your movies by the way. Did you like Dunkirk's announcement trailer? Yep. You did a great job. You have my ticket. Knowing that a movie was underway is enough with you nowadays. No need for any more trailers. Keep everything wrapped and we will be there opening weekend along with our friends. What?? Because we related to Star Lord?!?!?! hahahahaha!!! It was successful because it had a great story, great cast, and the effects were perfect! Don't laugh at me Cyranose de Bergerac, or I'll laugh at your nose. A story can't be good if you don't connect with the protagonists. A lot more problems than that my friend. It's brief and, from what I've read, pretty close to the role he played in the comics. The editing sounds like the biggest problem with both recent DC outings. I can't believe Will Smith can get a job as an actor. The guy can act. The problem I have with Will Smith is that I see the same Will Smith in every movie. The only time I've seen him act really well and for the part was is in Concussion. I enjoyed this movie a lot. There were problems, some things that didn't make sense, but overall it was a lot of fun. And that's what I wanted from this movie, so I'm happy. It wasn't nearly as bad as most of the internet would have you believe. Was it a good movie? Hell no! But it was fun to watch and worth my $8.00. All the previously noted problems exist, but they don't derail the movie or make it unwatchable. Harley, Deadshot, and Diablo are great. Many other characters are just kind of...there. The only one that I felt was utterly pointless was Boomerang. Anywho, it was a fun watch. Totally agree. After having kids we've not been for ages, but then the price of the tickets, etc, its been cheaper to be more picky in what Blu-rays to purchase and enjoy them at home. It's funny how some reviewers who bash a movie, take back what they say when a blu-ray version hits stores. I myself do not pay attention to reviews before I see a film, leaving my own opinion at best. Every movie has faults here and there, but Suicide Squad (and all DC/Marvel films) obviously are not an academy award film. So no need to criticize a popcorn film like it's Amelie. The problem is we have been spoiled with movies like Civil War, Guardians of the Galaxy, The Dark Knight, Deadpool etc. to expect anything less. Sure those movies have holes in them but not nearly as much as the last 2 installments from the DCEU. Reviewers were right in the case of BvS and the extended edition fixed some of the holes but it still didn't fix some of the plot points. I am too enthralled with these kind of movies, sometimes minor plot discrepancies can be forgotten. Most definitely. I just believe these characters are rich in story and deserve better treatment. Don't get me wrong I too enjoy them. You just hit the nail on the head with the comment about what we're spoiled with. I'm a "Marvel fanboy" but my favorite comic book movies were def the Dark Knight trilogy. I want so bad for DC to make great movies cause it's a win/win for everyone. It's the hype. What the trailer showed and what the movie is are vastly different imo. Studios are getting good and building momentum towards release. They rely solely on that initial thumb and the box office before word of mouth gets around. Sometimes the hype train drives people crazy. They believe in the hype train so much that they refuse to accept the fact that the movie might not be good. This is what leads to a lot of people calling for RT to get shut down or mindlessly raging against people with differing opinion. Not only has everything interesting already happened, but our glimpse into these things has been reduced to a jumbled series of short summarised flashbacks or reminiscence so we can quickly get on with the tediously long, uninspiredly mundane fight scenes that get us, first, nowhere and then to yet another CGI final boss (waiting harmlessly for our team to show up, as final bosses do). By this point, we are told the group has bonded, leaving me to wonder where that bonding took place as, up till now, they all just bantered to themselves next to one another. While there are some moments deserving credit or a smile, their number doesn't come close to the cringes or the sighs of boredom. Watching the film felt like listening to an "edgy" 12-year old's invented story. It shares the same lack of affinity with story-telling, character development and cohesion. In an effort to spice up the tone, they've edited everything so tight and sprayed it with so much music (some of which from recent, better films it tries to emulate) as if they hope we won't notice how disconnected, dull or dire it all is, but we did. I thought it was pretty funny. The bad guy/woman, were a bit eeeew, but I liked the Squad. "The problem, it seems to me, is attempting to make a movie that caters to the greatest number of people that it can. How do you do that? I don't get it and never will." I was watching Guardians of the Galaxy for the 4th time a couple of days ago and I realized that each Guardian is a different genre of movies. Star Lord - Comedy Rocket - Action Groot - Kids Drax - Revenge flick Gamora - Martial Arts THAT is how you cater to a greater number of people. I'm not saying this is the only reason the movie did so well. Not at all. But Marvel knows, they're not stupid how to attract more people than DC. Wow, that really was an utter mess. It reminds me of what friends and the big bang theory became. Short 20 second clips that offer a nugget of not a great deal before bouncing on to something else. Like the film had been constructed ready made to cherry pick a trailer from but unfortunately they chose literally all the best bits for the trailer hence there was nothing new for the film. The Harley scene with the lift was a classic example of this. Utterly pointless, meaningless fight, chance to play another 'cool' track and then walks out with everyone giving her the clichéd amazed look. Utterly woeful effort.